The Monaco team were in Rome last weekend for an international friendly against the Vatican City, which took place on 10/5/14, but the evening before saw a group match in the Coppa Sergio Valci - better known as the Coppa Vaticano - between the Guardia Svizzera (Swiss Guards) and Associazione SS Pietro e Paolo. 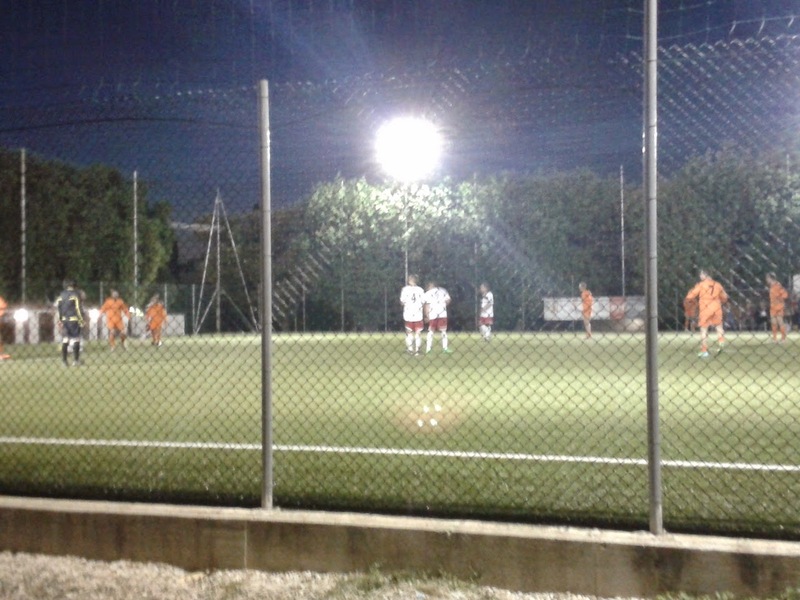 The venue was the Associazione Sportivo La Salle complex in the west of Rome, which caters perfectly for the current needs of the ACDV (Vatican FA) as it has two 8-a-side pitches available for use; until fairly recently, the Vatican league and cup competions both had 11-a-side matches, which were regularly played at the Stadio Spellman. Games are 60 minutes in length. 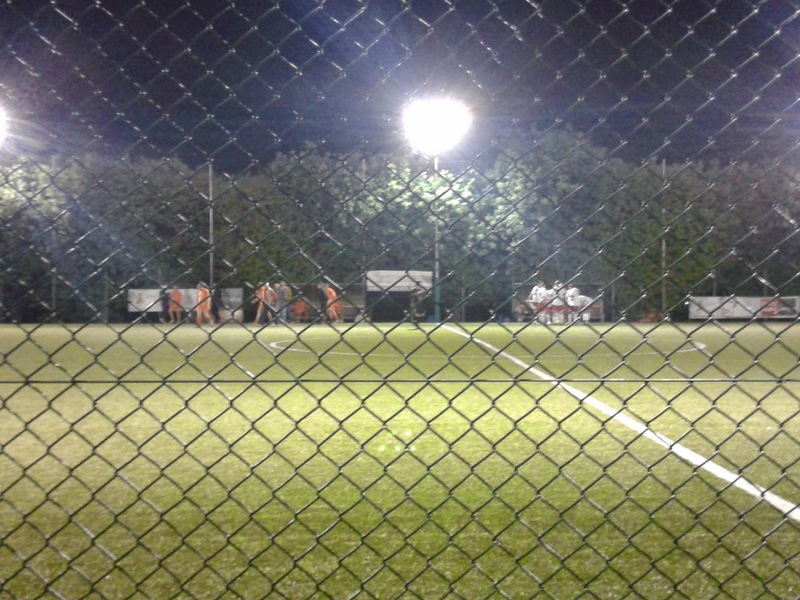 This fixture was the second for both teams in the group stage of the Coppa Sergio Valci after the first round had brought mixed fortunes for the two teams; Guardia had lost 3:1 against San Pietro, but P&P had better luck in their opening game, beating Dirtel by the odd goal in five. In what was to become a feisty encounter, with your correspondent finding himself to be the lone spectator, Guardia took the lead almost directly from the kick-off after a run down the wing, followed by a pass inside, from Daniel Hobi, which was met with a rather scuffed side-footer from Sven Stadelmann, which was still strong and accurate enough to evade goalkeeper Walter Maurer and creep just inside the right-hand post. P&P almost replied immediately through Paolo Nardi, but his half-volley, delivered after some good work by Salvatore Adamo, flew over the bar. There then followed a period where both teams engaged in some promising moves which did not deliver, until, in the ninth minute, Corrado Del Nero almost levelled for the team in orange after collecting the ball in midfield and forcing his way through, though Guardia 'keeper Rémi Castella saved his shot well. Five minutes later, Del Nero's Giorgio Rossini went close with a free-kick which curled just past Castella's left-hand post with the goalkeeper static. After Guardia's Hobi had two attempts on goal in as many minutes fisted away - the second most acrobatically after a goalmouth scramble - by Maurer, Stadelmann doubled his side's advantage on 19 minutes when he bore down on goal from midfield and struck a low shot into the left-hand corner of Maurer's net. P&P almost clawed their way back into the game, when a low corner came to Dario Collaiti in the penalty-area; his back-heel came to Adamo at the back post, but his side-footer went high and wide. Hobi then received a yellow card for a tackle on Nardi, which was then followed by Flavio Massimo Elmi's fine effort from distance going just past the angle of crossbar and Castella's right-hand post. P&P's next attack, in the 25th minute, led to Adamo bundling the ball into Castella's net just as an almight row broke out on the half-way line which eventually led to several players from both sides getting involved in an altercation, but the goal stood. P&P were in the ascendancy now, and Ruggero Rinaldin's shot from the left-hand side was palmed down by Castella but came back out to the P&P number 6, whose second attempt fizzed just wide. Parity was, however, restored after 29 minutes when Adamo fired a shot through a crowded penalty-area to Castella's right. P&P deserved to go in on level terms at half-time, as they had come back admirably from a strong beginning by their white-shirted opponents. The second half began with Guardia on the attack, and Roger Staub had the first shot of the half, which ended up going wide of Maurer's right-hand post. P&P's Ruggero Rinaldin had the chance to put his side in front after being on the end of a Corrado Del Nero header, but his deft clip past the onrushing Castella floated across goal but wide. Guardia regained the lead in the 34th minute, when Martin Büttler passed to Stadelmann, who completed his hat-trick by firing a fierce, low, shot to the left of Maurer, who could only palm the ball into the roof of the net. Two minutes later, Büttler got his name on the scoresheet when he nipped in just in front of the diving Castella to divert home Roger Staub's low cross. Daniel Hobi lashed a free-kick across the face of the P&P goal three minutes further down the line, and then melée in front of the Guardia goalmouth almost led to P&P reducing the arrears to just the one goal, when a half-shot across goal was almost shinned in by Corado Del Nero. P&P did get their third goal in the 39th minute, and Adamo was the second player to claim a hat-trick on the night, when a throw-in evaded everyone in the Guardia penalty-area, enabling Adamo to ghost in at the far post and sweep the ball over the line. Shortly before being substituted with 15 minutes left, Rinaldin then almost made it 4:4, but his shot from the right-hand side of the penalty area went just past the post. Manuel Steinmann's long-range free-kick on 46 minutes beat both the P&P wall and goalkeeper Maurer, but not Paolo Nardi, who cleared off the line, and the ball was worked up the field towards Giorgio Rossini, whose shot was expertly tipped over the bar by Castella. It was 5:3 and four goals for Stadelmann after 49 minutes; he broke from inside his own half, and, despite an ultimately futile pursuit from Nardi, crashed a shot into the top right-hand corner of the net. There was always a gritty feel to the game, and there was a yellow card for one of the P&P players on 50 minutes after a pull-back on Sébastien Roulin, which was the prelude to a variety of verbal exchanges between several players, leading to a little game of push-shove and a couple of players being pulled apart. The referee occasionally had his hands full, but had kept a good grip on things. There was still a football game to be completed, however, and Stadelmann had two bites at the cherry for his fifth of the night in the 53rd minute, when he, along with Roulin, broke through the P&P defence, but his shot was saved by Maurer; he then headed high and wide from the resulting corner when unmarked. Flavio Massimo Elmi's free-kick for P&P was then palmed away by Castella, and, in the closing moments, Büttler had the chance to net his second of the evening, when his shot from the left-hand side was beaten away by Maurer and came back to the Guard, but his second effort was tame and Maurer dropped on the ball at the second attempt. The referee blew not long after to signal the end of an entertaining match, and it was a deserved win for Guardia, whose pairing of Stadelmann and Hobi had worked extremely well together throughout the match and were aided by some good defending from Manuel Staub. Salvatore Adamo, as one might expect, took the plaudits as P&P's best player on the night, but Corrado Del Nero, who had been in the wars all night, also put in a good performance. Within half-an-hour of the end of the match, the lights were switched off and everybody had gone home, but the Guardia Svizzera were on the board. AUTHOR'S NOTE: Many thanks to Ivan Saric (Guardia team manager), Stefano Sacco, Paolo Nardi and Giorgio Rossini (P&P players and assistant manager) for kindly providing the team-sheets, and to them all and also to Giancarlo Taraglio (ACDV) and for patiently putting up with your correspondent's ham-fisted attempts to communicate in pidgin Italian. Any errors contained above are, as ever, the responsibility of the author; to finish, apologies for the rather poor quality of the photographs.